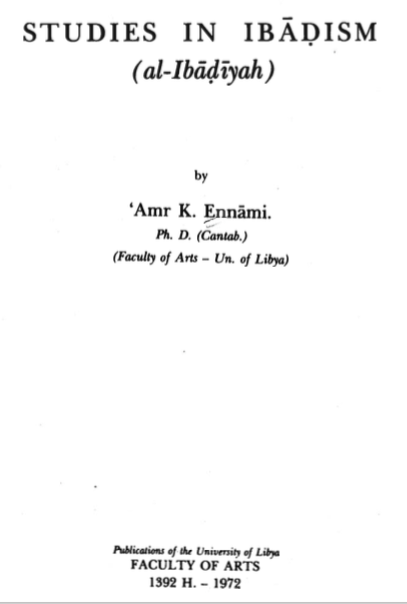 One of my first introductions to Ibadi studies was the well-known dissertation of the Libyan historian ‘Amr Khalifa Ennami from Cambridge University in 1971. Ennami holds a important place in the history of Ibadi Studies because he introduced many Anglophones to Ibadis for the first time. Like many English-speaking readers, I encountered the book in its 1972 edition published by the University of Libya under the title Studies in Ibadhism. Only after beginning my graduate program at the University of Michigan in the United States did I discover that Ennami had himself spent time in Ann Arbor. I was recently contacted by my friend Soufien Mestaoui (from Centre Ibadica in Paris) about a lecture Ennami delivered in Guerara, Algeria around 1976. In this lecture on the intellectual life of medieval Warjalan , Ennami mentioned that he had recently completed a translation and edited edition of Ibadi scholar Tabghūrīn b. ʿAysā al-Malshūṭī’s Kitāb al-jahhālāt in collaboration with Professor Trevor LeGassick from the University of Michigan. So, I contacted Professor LeGassick about Ennami and he gracefully agreed to speak with me about his time at Michigan. The first page from Ennami’s article on Warjalan, delivered in Guerrara. The article presents Ennami (pictured here) with the titles of Professor at the Al-Fātiḥ University in Tripoli and Visiting Professor at the University of Michigan. The French translation says the lecture was given in January of 1966, but I suspect this is a typographical error and it was in 1976. LeGassick spoke fondly of Ennami, describing him as a very kind, pious, and quiet man. Ennami was the first Libyan to receive a PhD in Britain, where he worked as a journalist while completing his doctorate. Like many Libyans of the 1960s, he was excited about the future of his country. The future he imagined, however, differed starkly from the one Colonel Mu’ammar al-Qaddafi was building . This earned him a bad reputation in the People’s Socialist Republic and when he returned to Libya his library was confiscated and he was jailed . When Ennami was finally released, he was given word through a friend close to Qaddafi that he had better leave Libya. It was through a shared adviser at Cambridge that Ennami came into contact with Professors Trevor LeGassick and subsequently Raji Rammuny at the University of Michigan . The latter traveled to Libya, eventually making arrangements for Ennami to come to Ann Arbor as a visiting scholar. He was not hired by the Department of Near Eastern Studies . Instead, his stay was financed with Libyan money. Inviting Ennami to the University of Michigan was an attempt by the institution to improve their relationship with Libya (it did not succeed). LeGassick could not remember the exact dates but Ennami arrived in the the mid-1970s and had left Michigan by 1976. 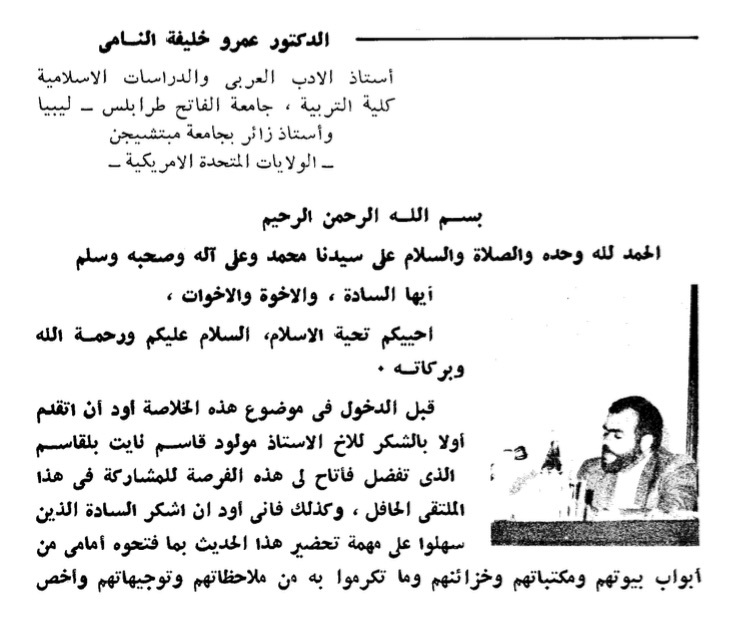 The first page of report from a 1978 seminar on the “The Present and Future of Arabic and Islamic Studies.” This was a report put together by Dr. Raji Rammuny at the University of Michigan. The seminar was intended to be a dialogue between professors at Michigan and Libyan universities. Both LeGassick and Ennami appear as collaborators. Through different channels, Ennami and his family received word while still in the United States that they would be moving yet again. This time, Qaddafi sent him and his family to Japan. Isolated and miserable, Ennami decided to leave Japan after only a short time and returned to Michigan in the late 1970s. Against the pleading advice of his colleagues in the Department of Near Eastern Studies, Ennami decided to return to Libya. LeGassick drove him to the airport. LeGassick said that he remembered that several months later he had seen images on television of Ennami’s house in Libya, on fire. There are some almost legendary stories of what happened when Ennami returned , but LeGassick was told the following version. A friend of Ennami’s had allegedly received funding from the CIA to set up an anti-Qaddafi radio station in nearby Italy that would broadcast into Libya. Knowing of the man’s connection to Ennami, Qaddafi contacted the latter through various channels, telling him to inform his friend in Italy that he should return home to Libya. This message included the doubtful promise that no harm would come to him. Ennami refused and for that his house was burned down and he was arrested, tortured, and presumably died while in custody. Although his time at the University of Michigan had been brief, I could not help but feel that my ending up there to study Ibadi history was a fitting coincidence. I spoke to Professor LeGassick just a few days before I defended my dissertation there on Ibadi Studies, many years after having been introduced to the subject by Ennami’s published thesis. I offer this brief story in homage to Ennami’s contributions to Ibadi Studies and I hope that his translation of al-Malshūṭī’s work will finally see publication in the near future. “Aperçu du mouvement scientifique à Ouaradjlane et dans ses environs depuis l’extinction de la dynastie Rostomide jusqu’a la fin du VIème siècle hegirien” ([in Arabic and French translation] in Majallat al-Aṣāla, Vol. 42-43, pp.41-66). Many thanks to Soufien Mestaoui from IBADICA for sending me a copy of this article. One biography of Ennami circulating on several different sites can be found here. In 2013, an announcement was made by the Libyan government that Ennami’s library had been found. What has become of it to date, however, is unknown: https://www.youtube.com/watch?v=ET0EvDz9npk. In addition to his translation of al-Malshūṭī with Trevor LeGassick, Ennami collaborated with Raji Rammuny on a book on Arabic phonology. I had initially thought that Ennami arrived at the University of Michigan as a visiting professor. Since he was not paid by the university, however, he does not appear in the records of the Department of Near Eastern Studies held at the Bentley Historical Library. The most famous is that Ennami was abducted while herding sheep, on which see the biography cited in  above. This entry was posted in Ibadi History (Other), Modern Ibadi Scholars, Scholars of Ibadi Islam. Bookmark the permalink.